You will also need a compatible contactless smartcard reader that has a unique electronic serial number. Depending on the make and model of reader used, Read-a-Card can identify, read and decode many popular card technologies, including MIFARE Ultralight, MIFARE Classic, DESFire, iClass and/or HID Prox card numbers. Note � this Read-a-Card e-license is most suitable if you have already purchased a compatible reader and wish to upgrade electronically. The reader must have a recognised unique electronic ID, which you can check by using the trial version of Read-a-Card. The software can be installed on any number of PCs but the specified reader must be connected when Read-a-Card is in use. Please include your electronic reader ID in the �special instructions� box during the checkout process, and we will send your license and installation instructions by email once your order has been processed. 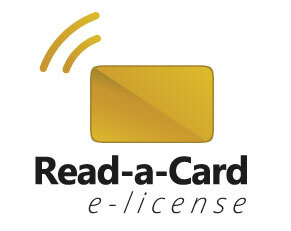 Most Omnikey and Identiv contactless readers support Read-a-Card e-licensing. The electronic ID may not be the same as the printed serial number - please use the free trial software to check and obtain your reader ID.